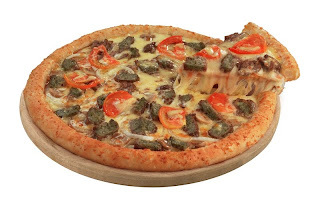 Greenwich has once again leveled up offering us with world-class food with their new premium pizza creations and the Big Time Meals that will satisfy our cravings and appetite for food. John Lloyd Cruz, Lloyd Zaragoza and the rest of the Greenwich gang indulge us to level up in life and food with their latest TV commercial while the basketball superstars of Smart Gilas offer us a good treat with Greenwich's 4 new superb meal combinations. 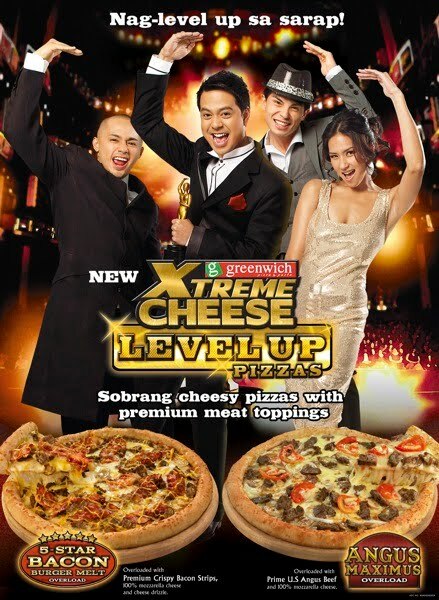 The first-ever Greenwich ‘world-class’ TV Commercial, with its Oscar-inspired theme and foreign cast, launches the two newest Xtreme Cheese Level Up Pizzas -- the Angus Maximus Overload and 5-Star Bacon Burger Melt Overload. These 2 new world-class pizzas are made for all those who deserve nothing less than greater world-class rewards. Greenwich’s 2 new pizza flavors have piled on so much more than the usual toppings. 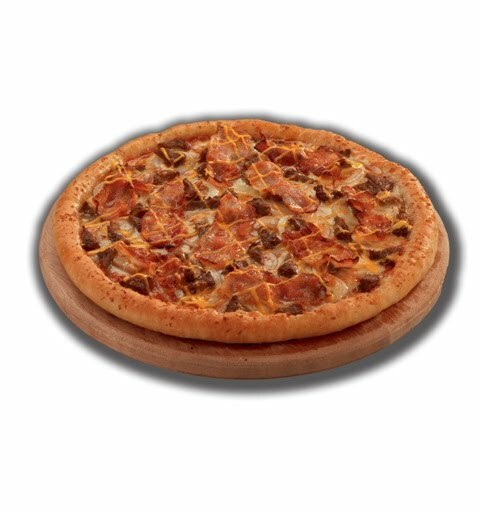 They are loaded with world-class meats and cheeses that are sure to delight any pizza lover. For a world-class pizza experience, the new Greenwich Angus Maximus Overload Pizza is definitely a premium treat. Think prime US Angus beef—a popular favorite around the world for its consistent tenderness and flavor. Add in a uniquely flavored pizza sauce blend and toppings of two times more mozzarella than the usual pizzas. Bacon, an American favorite meat product that goes well with burgers and cheese, is also on the new menu. Greenwich’s new 5-Star Bacon Burger Melt Overload Pizza makes the mouth water with its quarter-pound of bacon strips, all baked to crispy perfection, on top of juicy beef burger chunks, mushrooms, onions and twice the normal serving of mozzarella cheese, then generously drizzled with even more melted cheese. Every crunchy bite offers a taste that lingers on the palate and leaves you satisfied. To enjoy these two new Overloaded Pizzas wherever you and your friends are, just dial 5-55-55 for Greenwich delivery in Metro Manila, Philippines. The Philippines’ favorite pizza chain believes that it’s time for us to indulge in Greenwich's BIG TIME Meals, the biggest treat for people with heavyweight appetites. This is a good treat for the very hungry stomach. 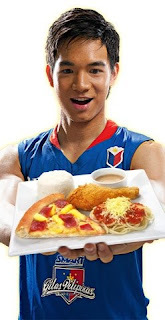 Endorsing these products are Chris Tiu, Dylan Ababou, JV Casio and JR Cawaling of Smart Gilas. 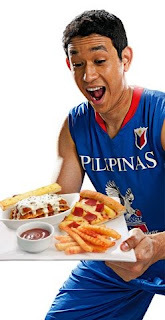 These basketball big-timers who spend so much time and energy doing exhausting basketball routines really know what big hunger really means, making them the perfect ambassadors for the BIG TIME Meals. The BIG TIME Meals have 4 superb meal combinations that surely satisfy even the most colossal cravings with its big-in-taste, full-size servings. What’s more, these meals are surprisingly light on the pocket with price starting at just PhP 99! Meal combinations include all-time favorites such as thick crust Hawaiian pizza which has the flavorful mixture of sweet pineapple and tender spiced ham topped with loads of cheese; Lasagna Supreme, the best-tasting premium pasta piled with three premium cheeses (special, cheddar and mozzarella), tomato & cream sauce and imported prime beef; Meaty Spaghetti, a bed of al dente spaghetti noodles with tomato-meat sauce and cheese topping; Crispy Fried chicken cooked in crispy and succulent perfection partnered with steamed rice; and Pizza Fries, the thick, tasty fries in ham & cheese, barbeque, pepperoni and cheese & garlic flavors. BIG TIME A has Meaty Spaghetti and fried chicken with rice for only PhP 99; BIG TIME B includes Meaty Spaghetti, fried chicken with rice, and slice of Hawaiian pizza for only PhP 119; BIG TIME C that has Lasagna Supreme, slice of Hawaiian pizza and pizza fries for only PhP 149; and BIG TIME D which has Meaty Spaghetti, fried chicken with rice and solo Hawaiian pizza for only PhP 149. 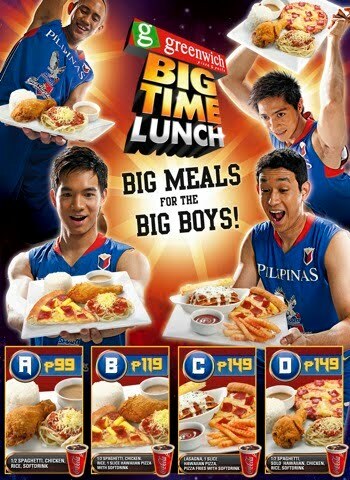 All the 4 BigTime Lunch combination come with a drink! Enjoy all your favorite Greenwich treats in one super-sized plate only at Greenwich! For delivery, just dial the Greenwich hotline 5-55-55.